I’ve written a research highlight for Nature Chemistry talking about Opwis’ and List’s recent paper on organotextile catalysis in Science. Take a look. This entry was posted in Literature and tagged Heterogeneous catalysis, List, Nature Chemistry, Opwis, Organocatalysis, Paul M, Science on October 24, 2013 by paulm. The synthesis of ketones bearing a diverse range of aryl and heteroaryl functionality is of great importance to the medicinal chemistry industry as they can be readily converted into structural motifs commonly found in medicinal agents. A novel approach to these scaffolds has been developed by Gaunt et al who exploit the inherent electrophilicity of diaryliodonium salts by using them to trap carbogenic nucleophiles to form carbon–aryl bonds. The driving force for this research is the lack of known methods for the preparation of bis-heteroaryl ketones. The authors set themselves the challenge of developing an organocatalytic method for the regioselective diaryl ketone formation which is tolerant of a broad range of hetreoaromatic nuclei derived from diaryliodonium salts and carbogenic nucleophiles. This was achieved by using a commercially available NHC-organocatalyst with DMAP as the base to form a nucleophilic enolate from the heteroaromatic aldehyde substrate. Subsequent trapping of this enolate by the heteroaryl iodonium salt gave the bis-heteroaryl ketone products in up to 91% isolated yield. The broad scope of this transformation was illustrated with a variety of aryl and heteroaryl aldehydes. More interestingly, however, Gaunt and co-workers have shown that the use of a non-symmetrical diaryliodonium salts is tolerated in excellent selectivity. Non-symmetrical diaryliodonium salts are more economical as they are prepared with only one equivalent of the transferring group. Out of a number of non-symmetrical diaryliodonium salts screened, a uracil-pyridine salt displayed the best selectivity with the desired bis-heteroaryl ketone isolated with no evidence of the undesired ketone identifiable in the crude 1H NMR. Finally, to further illustrate the utility of this methodology, the Gaunt research team demonstrated that a bis-heteroaryl ketone could be readily converted into enantioenriched amines by an Ellman imine formation and subsequent reaction with methylmagnesium bromide to give an α-tertiary amine in high yield and enantiopurity after cleavage of the chiral auxiliary. This entry was posted in Literature and tagged C-H activation, Gaunt, Heteroaromatics, JACS, NHCs, Organocatalysis, StuartL on March 19, 2013 by paulm. We’re delighted to welcome a new contributor to the Chemistry Cascade – Stuart Leckie. Stuart is a synthetic organic chemist whose main interest is in catalytic asymmetric transformations, although currently he has been side-tracked by a desire to save the planet and is working on the development of sustainable cross-coupling reactions. He completed a Ph.D. looking at novel applications of NHCs and isothioureas as Lewis base organocatalysts and he is also interested in all things involving samarium diiodide, especially it’s application in total synthesis. This entry was posted in Uncategorized and tagged StuartL on March 18, 2013 by paulm. Blog Syn – the site publishing crowdsourced verification of synthetic procedures – is only 3 investigations old but is already showing signs of maturing into a valuable resource for the synthetic community. Their 3rd investigation into the reliability of IBX oxidations of arylmethanes detailed some disappointing results in attempts to repeat published procedures. To their credit, the (high profile) authors of the original work engaged the contributors in a discussion of the variables in the experimental procedures. In a follow-up post to the discussion, the Blog Syn contributors propose that the active species in the oxidation is actually a hydrated version of the IBX oxidant and that the presence of water is critical in the reaction. This is fascinating stuff. The site had come under some heavy criticism recently for questioning peer-reviewed results without subjecting itself to the same process. But here’s the real beauty of a community-based discussion – we can all learn something new, and maybe even improve our understanding of chemistry. This entry was posted in Blog on March 7, 2013 by paulm. Molecules containing simple alkene functionality are attractive substrates in synthesis. Carbon-carbon double bonds are relatively stable groups, lacking polarisation, they can be carried through synthetic processes involving acid, base, mildly oxidative and reductive conditions. But, the availability of the π-electrons for reaction embodies remarkable potential for constructing substituted contiguous stereocentres and the possibility of introducing complex functionality to an all-carbon system. In recent years, functionalisation of unactivated alkenes has blossomed with developments in robust metal-catalysed processes and new oxidating agents. In the last few weeks several reports of new alkene functionalisations have been published that cover many aspects of this broad area, and show the diverse utility of alkenes in synthesis. Hayashi and co-workers have published an elegant cyclising difunctionalisation of dienes. The process is an iridium-catalysed C-H activation of cyclic aryl N-sulfonyl ketimines and gives spirocyclic aminoindane scaffolds with high diastereoselectivity. We’ve already discussed an asymmetric cyclising aminofluorination reaction carried out by a chiral hypervalent iodine fluoride oxidant. The reaction is endo-selective and prepares fluoropiperidine-based systems. Extension of the reaction to a racemic intermolecular process with styrene substrates was also demonstrated. In a similar example of intermolecular alkene difunctionalisation, Zhang reports aminocyanation and diamination of (predominantly) styrene substrates. 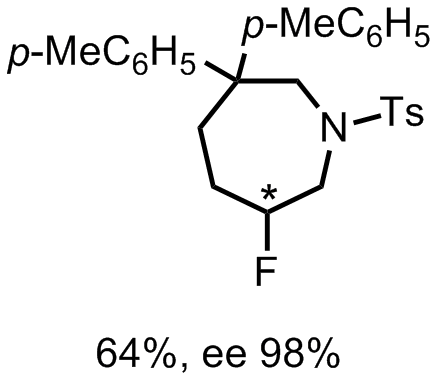 The principle reagent for functionalisation is NFSI (N-fluorobenzenesulfonimide), which aminates the terminal end of the double bond. Subsequent reaction with TMSCN gives the aminonitrile product. 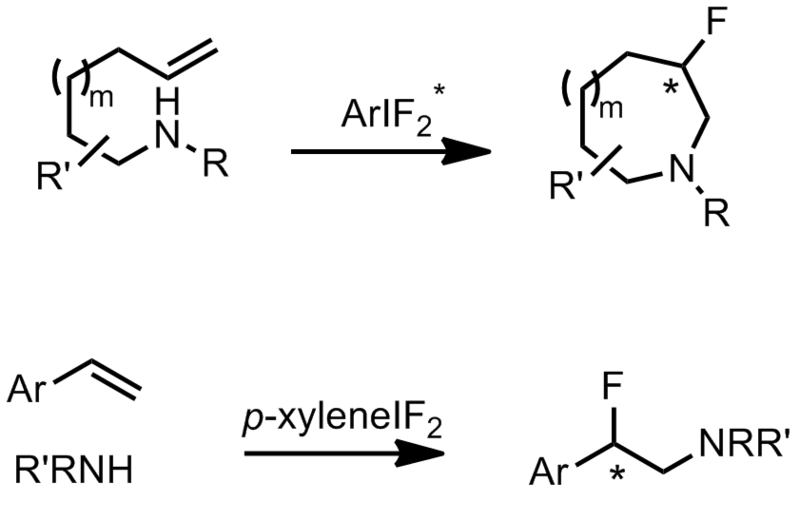 Alternatively, an alkylnitrile may be used to give the Ritter product of the second addition. The authors suggest a copper(I)-catalysed radical mechanism, generating a carbon-centered radical intermediate after amination by •N(SO2Ph)2. This reaction gives some idea of the kind of complex functionality that can be introduced to all-carbon alkene substrates by oxidative processes. Hydrofunctionalisation of alkenes doesn’t provide the same high degree of complexity as oxidative difunctionalisation processes, but reactions in this category do offer a great deal of diversity in synthetic options while still providing regio- and stereocontrol of sp3 carbon centres. A report from Qing and co-workers describes a general and high yielding hydrotrifluoromethylation of unactivated alkenes. Trifluoromethyl groups are useful moieties in pharmaceutical development of lead compounds. The group apply the method to a wide scope of unactivated alkene substrates showing tolerance to many other functionalities. Hartwig’s group in Berkeley have developed an asymmetric hydroheteroarylation of bicycloalkenes. The reaction is catalysed by an iridium DTBM-Segphos complex and tolerates various heteroaromatic coupling partners. Alkenes offer chemists widely available, stable and highly tolerant substrates for synthesis. Careful application of modern reactions allows the uncovering of diverse and complex functionality from a carbon-carbon double bond, and new developments provide ever more effective methods for the preparation of desirable adducts. This entry was posted in Literature, Review and tagged Alkene difunctionalisation, Alkene hydrofunctionalisation, Angewandte, Asymmetric synthesis, Catalysis, Cyanoamination, Diamination, Hartwig, Hayashi, JACS, Nevado, Oxidation, Paul M, Qing, Trifluoromethylation, Zhang on February 8, 2013 by paulm. Multisubstituded, saturated 5-, 6- and 7- membered heterocycles are part of many bio-active molecules. Fluorinated derivatives of such structures have also been shown to display better pharmacological properties such as solubility and metabolic stability. Hence their enantioselective preparation in a facile and efficient manner is of great interest for synthetic chemists. Classical approaches involve cycloadditions such as inverse-electron demand Diels-Alder or [2,3] azomethine ylide reactions1, whereas more modern approaches focus on transition metal catalysed aminoalkylations2. Cristina Nevado’s group in Zurich, have recently reported a metal-free regio- and enantioselective aminofluorination for the preparation of 6- and 7-membered fluorinated heterocyclic compounds. The reaction is highly regioselective yielding the 6-endo-cyclisation product only. Using their newly discovered conditions they investigated the scope of the intramolecular aminofluorination. From the data presented in the supporting information, aromatic substituents seem to have a positive influence on enantioselective induction. The preparation of 7-membered rings was also performed. However it required the addition of a catalytic amount of [(Ph3P)AuNTf2]. The authors also investigated the scope of intermolecular aminofluorinations in a non-asymmetric manner, using p-xyleneIF2 as the fluorine source. This method provides a facile route to fluorinated surrogates of saturated heterocyclic compounds. It would be interesting to see it applied for the preparation of morpholine or piperazine containing compounds in the future. 1. a) Geraldine Masson et al. Org. Bio. Chem. 2012 ; b) Marco Potowski et al. Angew. Chem. Int. Ed. 2012. 2. a) Josephine S. Nakhla et al. Org. Let. 2007 ; b) Matthew L. Leathen et al. J. Org. Chem. 2009. This entry was posted in Literature and tagged Alkene difunctionalisation, aminofluorination, Angewandte, Asymmetric synthesis, Cyclisation, George K, Heterocycles, Nevado, Oxidation, regioselective on January 31, 2013 by georgek86.